WAYNESFIELD, Ohio (June 18, 2016) – For a second consecutive season, Wooster, Ohio’s Sheldon Haudenschild scored an Ohio Sprint Speedweek presented by Cometic Gasket victory at Waynesfield Raceway Park, this time holding off pole sitter and Ohio Sprint Speedweek opening night winner Kyle Larson during a hard fought battle in traffic. Haudenschild, who started third on the Arctic Cat All Star feature grid, survived an epic three car battle during the late stages of the 35-lap main event, keeping Larson and the “Steel City Outlaw” Tim Shaffer in his rearview mirror. 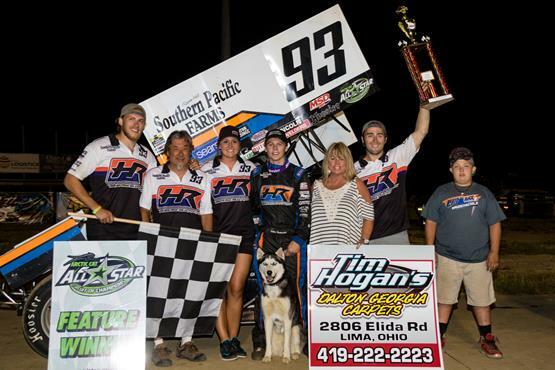 The Arctic Cat All Star Circuit of Champions victory increased Haudenschild’s season total to three, also bumping his career win total with the series to nine. The “Wild Child” Jac Haudenschild led the first five circuits at Waynesfield Raceway Park on Saturday evening, eventually losing the lead to NASCAR Sprint Cup series regular Kyle Larson on the bottom side of the speedway on lap six. Sheldon Haudenschild made his first bid for the top spot on laps 12 and 13, officially leading lap 13, driving by Larson in traffic. The pair dueled nearly nose to tail for the next six circuits before the main event’s first caution appeared on lap 20. Caution flags appeared once again on lap 21, disrupting the feature field for the second and final time of the evening. Ohio Sprint Speedweek presented by Cometic Gasket will continue with round three on Sunday evening, June 19, at the Millstream Speedway near Findlay, Ohio. The Randy and Lisa Hammer promoted half-mile did not host an Ohio Sprint Speedweek program last season, but did host the Arctic Cat All Star Circuit of Champions on two separate occasions in 2015, one during the month of July and one in September. Cody Darrah and Dale Blaney were the victors, each scoring $5,000 victories. Millstream Speedway will open pit gates at 2:00 pm on Sunday afternoon, June 19. A mandatory drivers meeting will be conducted at 4:45, followed by Arctic Cat All Star Circuit of Champions hot laps at 5:30. Racing is scheduled to hit the half-mile at 6:30. Those seeking additional information should visit Millstream Speedway live on the Web at www.millstreamspeedway.net.